Serving customers in Delaware County, Chester County and Northern Delaware with exceptional tree care. Located at 73 Saint Johns Drive Glen Mills, PA 19342. We are known for our outstanding customer service. Tree Guys prides itself on high quality service at low affordable price are located in Aston, PA.
We will travel to Delaware and Chester counties in Pennsylvania and also to Northern Delaware mostly Wilmington. We take pride in all of our professional services including tree removal, tree trimming and emergency tree work. Stump grinding gives the customer the ability to replant where a stump was removed and gives a better overall appearance to a customers property. Tree Guys can take care of all sizes of stumps. 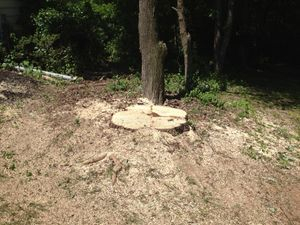 Below are before and after photos from a stump grinding job. The following website includes services and information guaranteed by Tree Guys. We guarantee the lowest prices and best quality service. Tree Guys Tree Service Call 484.432.0180Serving customers in Delaware County, Chester County and Northern Delaware with exceptional tree care. Located at 73 Saint Johns Drive Glen Mills, PA 19342. © 2018 Tree Guys Tree Service Call 484.432.0180Serving customers in Delaware County, Chester County and Northern Delaware with exceptional tree care. Located at 73 Saint Johns Drive Glen Mills, PA 19342. . All Rights Reserved.